MARILYN MONROE: WHAT A PLEASANT SURPRISE! After being laid off due to his age, a man (Woolley) dyes his hair and poses as the president of the company in order to hire back his co-workers. Cast: Monty Woolley, Thelma Ritter,David Wayne, Marilyn Monroe, Jean Peters, Thelma Ritter, Allyn Joslyn, Constance Bennett, Albert Dekker, Russ Tamblyn, Minor Watson . Director: Harmon Jones. I watched this innocuous little comedy this morning (on the Fox Movie Channel) b'cuz I'm on a Jean Peters mission. Well, I got my fix of Peters, trying to convince us she's in love with nerdy David Wayne in this. (Well, okay Jean...this is a comedy). But I got a bonus in watching this, becuz Marilyn Monroe was featured in it too. Re: MARILYN MONROE: WHAT A PLEASANT SURPRISE! Oh boy! If you ever, ever want to witness a star being really born, Niagara is it for Monroe. The camera just loves her, she looks incandesent, lit from within and without. You can take one of Jack Lemmon's many memorable lines from Some Like it Hot to describe Monroe walking toward the bell tower, "It's like Jello on springs." In this film, she was a bigger force of nature, bigger than Niagara Falls, itself. Re: As Young As You Feel. I enjoyed this one not long ago. I agree Monroe was playing everything straight. I think this is really early Paddy Chayefsky. It is unusually short and manages to make its point with humor and a small amount of pontificating. It is a fun premise if you can get past the idea that he could get away with such a big deception. At a young age this was my initial discovery of Woolley. Wow, Thelma Ritter was so good you listed her twice. But then isn't she always. Ha!! Movieman! You're right. I cut and pasted the synopsis from the FMC website. I think I'll let my mistake stand 'cuz you're right...again. Thelma Ritter is so good she should be listed twice. Well, I've just seen the Misfits and the stills do not do her justice. I can't decide if she looked better in black and white or colour. A force of nature, most definetly. charliechaplinfan wrote: Well, I've just seen the Misfits and the stills do not do her justice. I can't decide if she looked better in black and white or colour. A force of nature, most definetly. In today's climate, she's be deemed too fat to get work in Hollywood. Sad. Allison, I think she looked good, period. Color/black & White/tinted green, the camera, still of movie l-o-v-e-d her. From what I've read, Monroe was all too aware of the difference between Marilyn the Star and Marilyn the Actress, and she would have loved to have been taken more seriously. And she had good reason. I thought she was very good as the damaged babysitter in Don't Bother to Knock, and she was especially good in the supporting role of the small town girl in Clash By Night. It's beyond obvious that the "boy" and "girl" of this story are sexually involved, but Monroe keeps it so sweet and real that it's something of a surprise to reconcile this natural and appealing girl with Marilyn the Star. I only came across those early roles recently and they were a revelation to me. Yes, she could act and quite well but I wonder if she believed it. She was superb in The Misfits, starring with two big names and dominating performers but she shone. I think the role was a mixed blessing, yes it was based on aspects of her personality but she hated the hysteria called for in the desert. Despite all her troubles durimg the production her performance was one of the best of her career. "From what I've read, Monroe was all too aware of the difference between Marilyn the Star and Marilyn the Actress, and she would have loved to have been taken more seriously. And she had good reason." - jdb1. I believe I've read that myself; that she could go unnoticed...and then she could pull Marilyn out and bingo!!! Instant riot. I enjoyed her also in "Don't Bother to Knock" or looking up from the couch in "The Asphalt Jungle." It's just a small nugget of discovery for me when I see her in something before she was imprisoned by Her Image As Marilyn Monroe. If there was anyone I would love to bring back and have a conversation with, it'd be her. From what I've read, she was different things to different people, some saw the intelligent/non dumb blonde side who talked in a normal voice and some saw the breathy, neurotic star, others a mix. One can only wonder at what she really felt inside. charliechaplinfan wrote: From what I've read, she was different things to different people, some saw the intelligent/non dumb blonde side who talked in a normal voice and some saw the breathy, neurotic star, others a mix. One can only wonder at what she really felt inside. I think Marilyn had a lot going on inside, and that caused her a lot of inner torment. I have always felt a lot of empathy for her. I think it has also to have been difficult to be viewed as a "thing" and not a person. Her screen persona was one thing and I am sure her person was very different. To not have been taken seriously as a human being. This is not to say she did not have flaws or serious problems, she did. I'm grateful, for all her torment, she left some wonderfully marvelous performances for generations to come. I've really grown to like her in just about everything I've seen her in. I can't quite warm to Olivier in The Prince and the Showgirl, but I'm sure the filming was not entirely a picnic. The Prince and The Showgirl was not one of Olivier's best films or Marilyn's, she does steal his limelight. 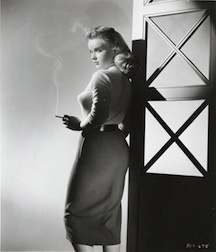 I was struck when I watched The Misfits how Roslyn (MM's character) had a similar background to Marilyn. I read Arthur Miller's book Timebends a while back, he attributed much to maternal and paternal neglect, didn't think she could ever feel loved enough. Maybe those who entertain so brightly aren't meant to find peace. Marilyn was always a pleasant surprise !